Red Oak Unfinished Retro Stair Tread 36" wide for overlaying an existing staircase with a wall on both sides ( closed staircase). Red Oak Unfinished Retro Stair Tread Closed 11.5 in wide x 36 in long - shipped sanded and ready for you to apply stain and polyurethane. I did not see any video or instructions for installing the closed or mitered retro stair treads. My staircase is carpeted. I would like to use the retro treads. however, the 1st 4 stairs are open and have railings on either side. I am not sure how to attach the balusters to the new treads. the closed treads look very straightforward. You will install the mitered treads the same way you install the closed treads. You will need the throat measurement before you order. The throat measurement is the area were the riser fits in between the returned ends. In order to install the balusters you will need to drill a hole in the newly installed treads. what's the difference between unfinished and prefinished? Unfinished product is sanded and ready for you to apply your own stain and polyurethane whereas prefinished products ship with our UV topcoat applied and ready to install - there's no need to stain the product or apply a topcoat. Unfinished means that this product is "raw wood" and does not have a clear coat applied. You will need to apply your own coat of stain and polyurethane in the field or at the jobsite after receiving these treads. If I have stair treads that are 9" deep and put an overlaying stair tread on top of them, my concern is that a wider step will be unsupported on the end. Is there a good rule of thumb as to how much overhanging,unsupported step I can use before I take the risk of breakage? I don't suggest leaving any part of the tread unsupported. I would suggest ripping the 11 1/2" deep treads we have to fit your 9" depth. You could also install our traditional 3/4" riser to build out the staircase, in this case you would also still need to rip the tread down to fit your depth. 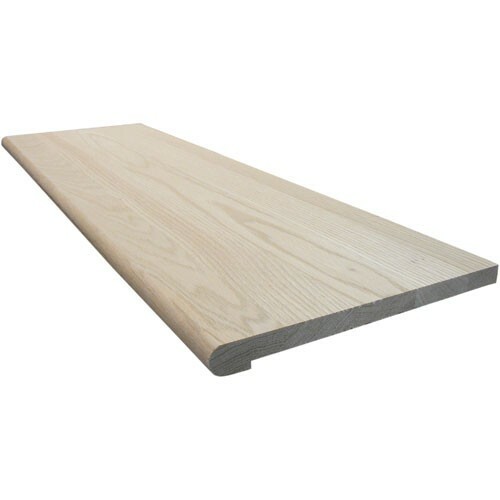 do you make stair treads 96" long x 12" deep and how much would they cost, i need 20 pcs. to re build steps on a stage, also what is the lead time and ship cost. If you'll include your zip code I can put together a quote with the total cost and a lead time. The large landing at the top of our stairs is carpet. How do we transition from the wood stairs to the carpet landing? At the very top of the staircase where the last step, is actually the floor to the upstairs, you will want to install a landing tread. The landing tread is a 5 1/4" wide, and 3/4" thick. There is also a groove in the back for carpet or 3/4" plank flooring to be tucked into the groove. You can find the landing treads at the link below. I have 13 steps but there is also a wide landing where the staircase truns the corner. How do you reccomend retrofitting the landing? We recommend the landing tread with 3/4" plank flooring to fill in the landing. Another option is our panel system. You can see more about these 2 options at the link below. If your treads are installed in the sides of the skirtboard, you will need to fill the small gap left when you remove the existing bullnose. The new retro tread will cover the majority of the gap but there will likely be some of the gap that remains visible. Most customers simply fill the space with wood filler and paint the skirtboard but if you are installing a veneer over the existing skirt, the new veneer will cover any exposed holes or gaps. Hi. Would you consider making a Brazilian Cherry tread to go over an exisitn pine box tread? Thanks. A Brazilian Cherry Retro Tread can go over any existing tread whether it is pine, oak, or any other construction grade. You can find Brazilian Cherry Retro Treads at the following link! I want to use retrofitted stair treads over existing pine stairs that are currently covered in carpet, however I am worried about the rise of the initial step. Currently from the floor to the first step it is a rise of 7 7/8 of an inch, and from what I can tell an 1/8th over code. If I add a retrofitted step which will add another 5/8 of an inch this will bring me to 8 1/2 inches from the floor. Is this variance allowed? I know the other step will fall into place, I am just worried about that first step. If you are installing retro treads, they will all be increased by 3/4". You will not be able to tell by looking at the staircase or walking on it that there is a height increase. The first step will be fine with a retro tread installed on top of it. What is the best way to fasten the new treads over old treads. We recommend using construction adhesive such as Liquid Nails or PL 400 as well as finish nails in the corners of the treads. Once the adhesive sets, it will create a permanent bond and eliminate the potential for future squeaks. Are your unfinished oak treads one solid board or are they several pieces that have been edge glued together to get the full 111/2" board? Please see our link below about the industry standard construction of our stair treads! Is there a formula for how deep a landing at the bottom of a staircase should be? Our stair treads are 12 1/2'' deep. There is a wall on one side of the staircase. The other side is open. We plan to make a 48" open doorway on the wall of the staircase at the bottom of the stairs. I am not sure how much room to leave between the end of the stairs and the beginning of the 48" opening on the staircase wall. Thank you. There's not an official formula for the landing size but a good rule of thumb is to make a starting landing at the bottom of a staircase at least as wide as the stairs and at least three times the depth. This allows a comfortable area to start or finish your walk up and down the staircase. Most of the landings we see measure around 42" or so wide x about 36" deep. I have finished oak bullnosed treads on my stairs that have wear and some cracks - can I put these over the existing stairs. What would the process be? That really depends on the condition of the existing steps. As long as they're structurally sound, you can use the retro treads to overlay any cosmetic problems but overlaying a structurally deficient tread is not recommended. If the sub-tread is broken in separate pieces, it could lead to squeaks in the future and we recommend making repairs before installing the retro treads. Overlaying minor cracks and wear is perfectly acceptable - in fact, using a retro tread may be the only way to reface the stairs if the wear is significant. If the sub-tread is severely worn, it may be necessary to shim the new tread to achieve a level install. How much sanding do your unfinished red oak treads require before staining? Do I just need a quick 120 grit sanding before staining? We recommend 120 grit sandpaper, it won't need much sanding just a quick run over of the tread. Are sub-treads needed to can the treads be directly applied to the stringers? The retro treads are for overlaying existing treads (subtreads). 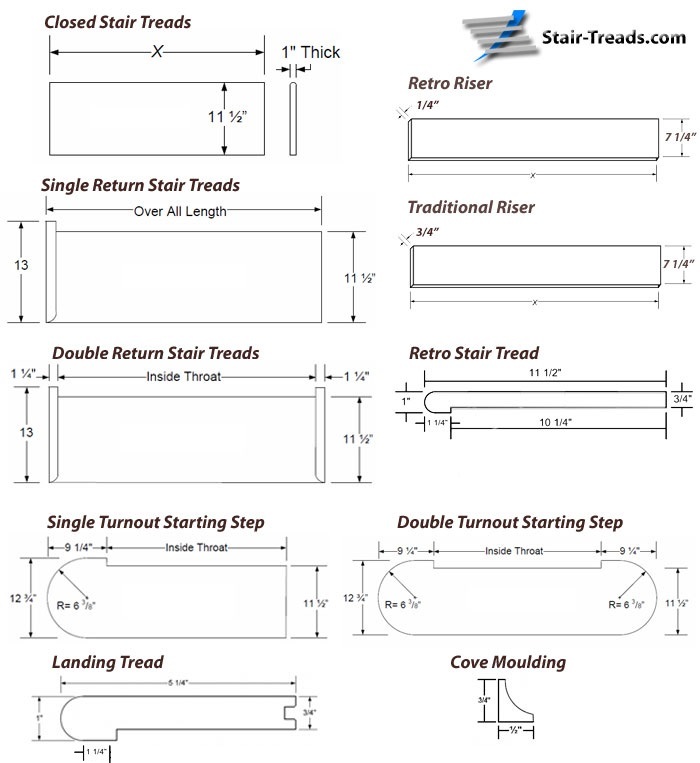 If you want to apply a stair tread directly onto the stringer, we recommend the 1" thick traditional treads, which can be found at the link below. You can use the left side of the screen to sort out Length, profile, or species or tread you are looking for. I'm putting down 1/2" engineered hardwood both downstairs and upstairs. These treads are 3/4 ". Is this an issue I need to address somehow? The only issue this may create is at the very top of the staircase. Our landing treads are 3/4" thick so you would want to sand down our 3/4" thick landing tread or have the flooring company provide a matching nosing piece. From the dimensions you give, the unfinished Red Oak Retro Treads would be a great fit for your staircase. The retro treads can be installed over either a set of roughed in stairs or over an existing pine step. A standard retro tread will cover a tread up to 10 1/4" wide after any overhang is removed. The smallest size we make is 36" and it can be cut to fit your 31" stair. At the intersection of the landing and on the top of the staircase, you'll need a landing tread (see http://www.stair-treads.com/red-oak-unfinished-landing-tread-36-in.html ) instead of a full sized tread. The landing tread is installed along the edge of standard 3/4" hardwood flooring installed on the landing and on the upper level. These treads appear to be 3" wide 3/4" hardwood planks glued together as opposed to a solid piece of wood. How much attention to detail is used to make sure grain matches. You are correct - each stair tread is made of "staves" or individual pieces of wood that are edge glued for tread stability. These staves are reverse grain glued in a way that prevents most warping or cupping and is an industry standard. We make every attempt to assemble the tread from boards of similar grain pattern and coloring so that each tread is consistent with both itself and the other treads in the staircase. Once installed, the treads should resemble an average 3/4" select or better grade flooring. My stairs are 36" wide. I'm worried there might be a small gap if the tread isn't exactly 36" wide or the stairs are aren't 36" wide. Should I buy a wider tread and cut them down? Also do I need to use a sliding chop saw? I have a table saw. Wouldn't that work? Also what size finish nail to you recommend? We recommend that if your treads are a little more than 36" to go up to the next size and cut to fit. This gives you a little room for error. You can do it with out a sliding chop saw, and use a table saw. The sliding chop saw, is just a little easier. We recommend that you use 15 gauge to 18 gauge finished nails. Do you also have or make 5/8" thick Red Oak unfinished retrofit stair treads? 3/4" body will not match the thickness of the existing staircase trim. The only thickness retro tread we make is 3/4" at the body. Thinner boards at this width are very prone to cupping and warping. You're most likely describing the trim boards on the edge of the staircase where balusters connect. The best solution to remodel staircases like these is to remove those boards and install a left or right return across the entire step. Attempting to salvage those trim pieces will typically result in a look that is less than ideal. The nail holes from a 16 or 18 gauge nail should not be very noticeable. If you can see the holes, and want to use something to cover the nail hole, we recommend Minwax Nail Putty. You can purchase Minwax nail putty at most local hardware stores. All you would need is a small bit of the putty in each nail hole, and the hole is no longer visible. Should we polyurethane the bottom of the treads, too before we install them? Polyurethane on the bottom of your stair treads is not usually necessary. I need retro fit treads with a right return, but the depth of my existing stairs is only 9 inches. Can treads with a return be cut to a smaller depth? Yes, we can make the depth smaller to fit your needs. I have 39" wide stairs - how do I fill in the extra space if the tread is only 36"? You'll need to use the next size up from this 36" stair tread. In your case I'd recommend a 42" tread that can be cut down to size. If your stairs are less than 36", this tread will work fine for you. I am trying to match an existing red oak color scheme on the main floor. Do I pick out a stain that will complement the existing or will the polyurethane bring out the colour itself? There are a mixture of red oak colors having the knots, it is a prefinished product considered seconds, of various lengths. When picking a stain color we HIGHLY recommend ordering the Red Oak Sample Pack. It comes with all of our stain colors on red oak that you can compare with the floors in your home. You can either pick the best match, or something that will contrast well with the rest of the flooring. Below is the link to the Red Oak Sample Pack, you can also order this quick shipping sample over the phone. There is also literature that is included with the sample pack that is very helpful when planning a staircase install! Do you guys actually make these or buy them from somewhere else? We are the manufacturer and the distributor. Our stair treads, risers, landing treads, cove moulding and starter steps are all made on site. The retro treads are 11 1/2" deep overall with a 10 1/4" undercut (the part of the tread that is 3/4" thick) and a 1 1/4" bullnose. All of our treads can easily be cut on a table saw if the tread is too wide for your particular step. are these retro stair treads guaranteed to not be warped at all, on arrival? I like the unfinished retro treads for my project however, I also have a small landing. Where can I find and easy solution for matching your retro tread product with my landing? For medium-to-large sized landings, the best option will be to install standard 3/4" unfinished flooring along the majority of the landing and finishing the edge with a "landing tread." We do not sell unfinished flooring but it should be easy to source locally from a flooring store or even a home improvement warehouse. My steps are 12 1/4 inches deep! Can you provide a deeper tread than your standard 11 1/2 inch? And, if so, can they still be delivered prefinished? What would your prices be? We can make treads up to 23" deep prefinished and up to 35" deep unfinished. There are several different factors to consider with deeper treads so we quote all non-standard treads individually. Please contact us for a quote on the larger treads. Can I get away with installing these retro treads without cutting the existing bullnoses by installing thicker (build up) risers? Yes you can. The only thing you would have to watch out for is that the new treads bullnose does not stick out past the skirt board once installed. You can use any polyurethane product. Bona-kemi makes a great finish, but any commercial off the shelf finish will work. After removing the carpeting from my stairs I discovered the old treads were made from 2x10 framing lumber. Several are not true or level. I have noticed cupping and there is a slope of a quarter of an inch or more from back to front on some. Is it possible to use shims under your treads? If so how should the void underneath be filled? With lots of adhesive? We recommend securing 1/4" or 1/2" plywood with adhesive and nails to make the steps as level as possible prior to installing our treads. Feel free to contact our sales team directly at 866-429-0979 for further assistance with placing your order. We are happy to help! if the stair tread is 3/4"thick ...what thickness does the bullnose measure? Is this tread ready for stain or do I have to do something to it first? This stair tread is ready for stain. You may want to lightly sand it with 220# sand paper first to remove any dust and imperfections accumulated during shipping. 1 1/2" or 2" finishing nails will be perfect. With red oak you do not need to drill holes in the wood. Using a nail gun is the best way to nail down the treads.